The adidas NMD TS1 is one of the Trefoil Brand’s most interesting new silhouettes. Presenting a look that’s highly technical — sometimes even using materials like GORE-TEX — but still inherently wearable, it toes the line between form, function, and fashion masterfully. Now the Three Stripes is calling upon two of their most esteemed collaborative partners — BAPE and Neighborhood — for a bold new take on the striking sneakers. The pair of Japanese street fashion powerhouses call upon a smoky grey mesh for the shoe’s base, while black printed tribal-style overlays add detail and a small jagged yellow hit on the midfoot offers a pop of shocking color. Co-branded hits and Japanese characters appear in white on the throat shroud, and the shoe is then completed by a white Boost midsole with black bricks. The overall look is more Neighborhood’s technical street style than BAPE’s logo-and-pattern-heavy look, ideal for the winter months — so grab a first look at the new kicks here, and stay tuned for release/pricing information as it’s available. 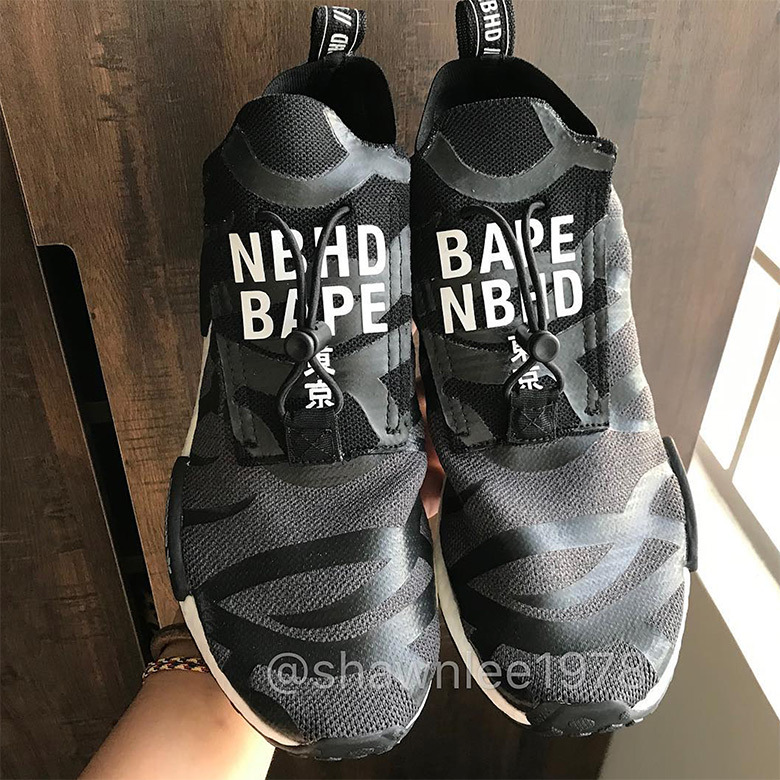 The post BAPE and Neighborhood Are Cooking Up An adidas NMD TS1 Collaboration appeared first on Sneaker News.